"Power, glory, rock n roll with a whole lotta soul,” says frontman Ricky Warwick. “You gotta testify or say goodbye. Tell me no secrets, tell me no lies. Get up on the stand look me straight in the eye. You gotta testify or say goodbye... Kinda says it all, really!" The tune follows the project’s lead single, “When The Night Comes In”, as the second preview of “Heavy Fire”, due out February 3. 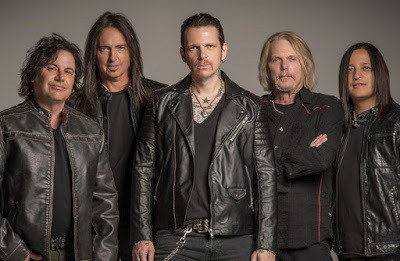 Black Star Riders recorded album number three just outside of Nashville, TN with producer Nick Raskulinecz (Rush, The Foo Fighters, Mastodon). "Not many new bands get to record three albums these days,” explains guitarist Scott Gorham. “Without doubt this is BSR'S best album so far. We had a great time recording it and can't wait to play the new songs live on tour in March." The band will launch the record with a tour of the UK and Ireland that begins in Cardiff, Wales on March 2.